Zion Market Research has published a new report titled “Hybrid Fiber Optic Connectors Market by Attenuation (0.1dB, 0.5dB, 0.75dB, and Others), by Length (Less Than 100mm and More Than 101mm), by Endurance (500 to 2,000 cycles, 2,000 to 20,000 cycles, and More Than 20,000 cycles), and by End-Use Industry (Telecom, Oil & Gas, Aerospace & Defense, Healthcare, Transportation, and Others): Global Industry Perspective, Comprehensive Analysis, and Forecast, 2017—2024”. 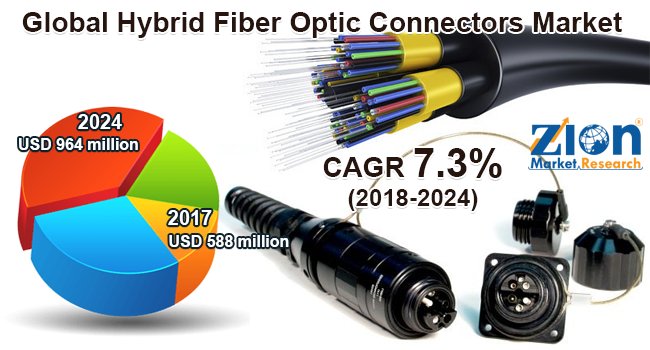 According to the report, the global hybrid fiber optic connectors market accounted for USD 588 million in 2017 and is expected to reach USD 964 million globally by 2024, at a CAGR of around 7.3% between 2018 and 2024. Hybrid fiber optic connectors connect fiber cables, to ensure stable connections and proper end-to-end fiber alignment. These connectors are manufactured from stainless steel to resist corrosion when exposed to harsh environmental conditions. The increasing transportation by airways is likely to fuel the hybrid fiber optic connectors market in the future. These connectors are used for security and control systems for data acquisition and transmission. In 2017, the global commercial airline's sector generated about USD 754 billion in revenue as compared to USD 709 billion in 2016. Furthermore, in 2017, the global number of aircraft fleet was 28,500 as compared to 27,400 in 2016. This number is projected to rise in the future due to growing tourism globally. This, in turn, is anticipated to drive the hybrid fiber optic connectors market globally over the forecast timeframe. The flourishing telecom sector is likely to further fuel the hybrid fiber optic connectors market over the estimated time period. Fiber optics is used by various telecom companies to transmit telecom signals over long distances, cable TV signals, and internet communication. The organizational spending on telecom services has increased over the last few years. In 2017, the global spending on telecom services and paid TV services increased to USD 1,662 billion, about 1.4% more than that in 2016. The hybrid fiber optic connectors market is divided based on attenuation, length, endurance, and end-use industry. By attenuation, the market is divided into 0.1dB, 0.5dB, 0.75dB, and others. By length, the market is divided into less than 100mm and more than 101mm. The more than 101mm segment is projected to hold a substantial market share over the forecast time period, due to its increasing adoption in the oil and gas sector. The endurance segment of this market includes 500 to 2,000 cycles, 2,000 to 20,000 cycles, and more than 20,000 cycles. The 2,000 to 20,000 cycles are likely to grow lucratively over the estimated timeframe, due to the huge product demand by the defense sector. By end-use industry, the market is segmented into telecom, oil and gas, aerospace and defense, healthcare, transportation, and others. North America is likely to witness considerable growth in the global hybrid fiber optic connectors market over the forecast time period. The U.S. is anticipated to be the most lucrative market in the region, due to the huge production of hybrid fiber optic connectors leveraged by technological advancements. In the Middle East and Africa, UAE and Saudi Arabia are anticipated to drive the region’s hybrid fiber optic connectors market, due to the growing use of connectors in the oil and gas industry. Some key players of the global hybrid fiber optic connectors market are Diamond SA, Amphenol Corporation, LEMO, Hirose Electric Company, Staubli International AG, QPC Fiber Optic, LLC, Smiths Interconnect, Inc., TE Connectivity Corporation, and Teledyne Technologies, Inc., among others.